The Patient Student Partnership will pair our students with a chronically ill adult or pediatric patient to follow for all four years of medical school. With the success of the Phronesis Project (which we wrote about here), the School of Medicine has expanded this longitudinal patient experience and made it part of the curriculum for this year’s incoming class. 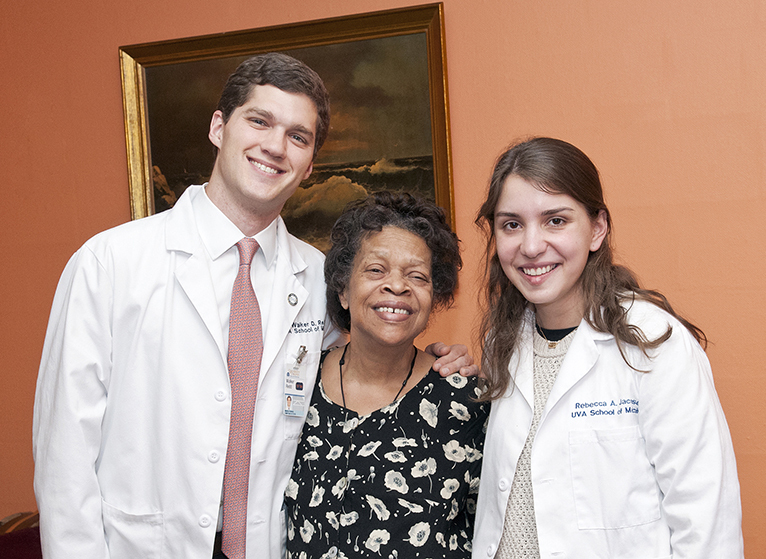 This program, known as Patient Student Partnership (PSP), will pair each of the 160 students in SMD22 with a chronically ill adult or pediatric patient to follow for all four years of medical school. Students will attend clinic visits, be present as the patient’s advocate, and help the patient navigate the Health System. This partnership will give students the opportunity to learn about healthcare through the eyes of a patient and to witness the trajectory of chronic illness. This first patient relationship will give students context to their medical education and will provide them with a real-world touchpoint, something in which to ground their newly acquired knowledge. Clinicians: Please be aware that, starting in October 2018, first-year students will accompany patients to clinic visits in the role of patient advocate. Pre-clerkship faculty who teach students: Students now will have real patients and thus real exposure to health problems to complement classroom learning. This is a notable moment in the continuous improvement of our curriculum. Students will receive unique patient exposure during their first semester of medical school. This relationship promises to be an enriching and rewarding (and educational!) experience. It is my hope that the early formation of a special doctor-patient relationship will remind our students exactly why they chose to study medicine at the University of Virginia in the first place. As students enter their fourth year of study, they will begin the process of handing off their patients to the newly arriving first years — and the cycle will begin anew for many of our patients. Everything we do at the School is in service to our patients, and the feedback from previous years’ participants has been very enthusiastic. Patients loved the same thing I love, namely, watching our students grow and evolve into young physicians. And the students have recognized that our patients are our best teachers — something most doctors always have known. Thank you to all of the faculty who worked on the Phronesis Project. That pilot set the groundwork for this amazing next step. Also, thank you to all the primary care clinics and specialty practices across Grounds who aided in recruiting patients and provided this opportunity for our students. And most importantly, I thank our patients. Without their generosity this initiative would be impossible. For more information on PSP, visit the website. If you have questions, contact Colleen Kiernan.